Home » employment law » Perspectives on Probation, Confirmation and Promotion in Employment Contract | Kayode Omosehin, Esq. 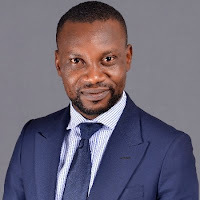 Perspectives on Probation, Confirmation and Promotion in Employment Contract | Kayode Omosehin, Esq. Probation is simply an agreed trial period for a worker to prove his worth on a job to his employer and assess the worth of the job to himself. Promotion is an elevation of a worker in status within a company based on performance or other considerations as may be agreed in an employment contract or determined by the employer. Confirmation is the intermediate act of endorsement of a new worker’s performance by a company sometimes between the periods of probation and promotion; it is a testament that an employer is satisfied with the performance of a new employee. Probation and promotion of a worker are, generally, matters which are based on each worker’s contract. As such, an employment lawyer needs to review the employment contract before an opinion can be formed on the ramifications of an employee’s probation or promotion. Where the terms of employment are contained in various documents, it is important to read all the various documents together to decipher the intention of the parties regarding probation or promotion. From experience, the offer letter of employment, the appointment letter (if it is different from the offer letter), the terms and conditions of employment, staff hand book, policy on review of rank/grade level, disciplinary procedures rules as well as official circulars and notices circulated internally are all relevant in determining the respective rights and powers of workers and employers on probation and promotion. 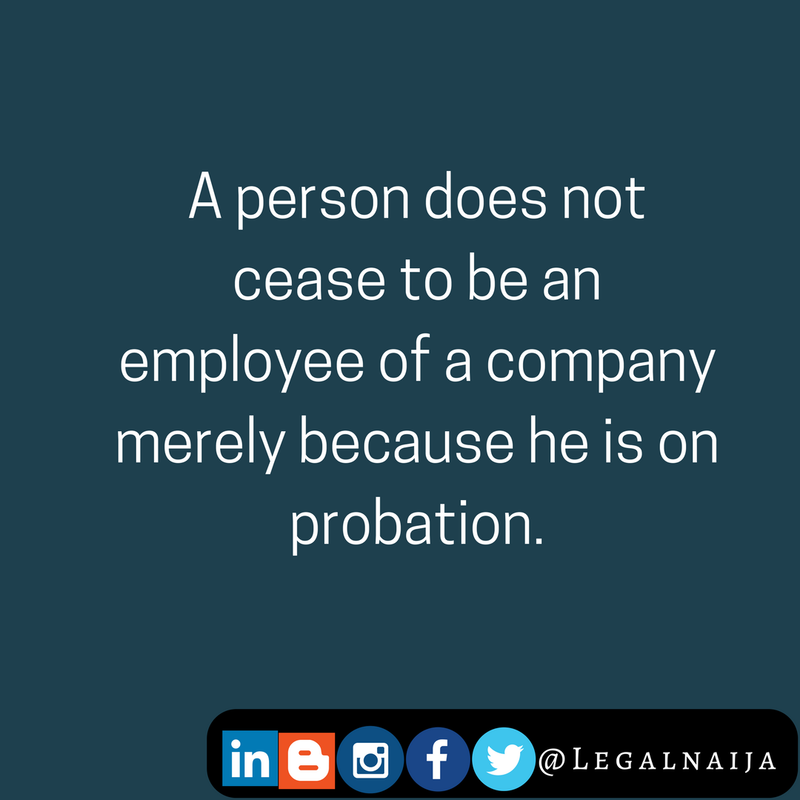 A person does not cease to be an employee of a company merely because he is on probation. As such, in my view, a worker on probation is entitled to all express benefits in an employment contract or those implied by the labour law. Interestingly, however, Justice J. D. Peters of the National Industrial Court held in Ogbonna v. Neptune Software Limited  64 N.L.L.R. (Pt. 228) 511 that an employer is not under any obligation to give notice of termination of the service of an employee who is on probation until the employment is confirmed. In other words, according to Honourable Justice J. D. Peters, the employment relationship between a worker and a company in thatOgbonna case was inchoate and that the need to give a notice for termination for one calendar month stated in the claimant’s letter of employment would only arise after the confirmation of his employment. It is difficult to agree with the reasoning of the judge in the foregoing case given that an employment relationship is founded on contract following offer and acceptance, with consideration taking the form of the employee’s resumption and performance of a designated job. There are many judicial decisions of a superior court to the effect that a contract of employment comes into existence when a clear offer made by a company is unequivocally accepted by a job applicant provided that there is no outstanding condition precedent to assumption of work which must be fulfilled by the applicant. In fact, and law, if such outstanding conditions are in the form of medical clearance, provision of referees, verification of credentials etc. (as they usually are), the employer can neither unilaterally revoke the offer after the applicant’s acceptance of same before the deadline for fulfilling the other outstanding conditions, nor prevent the applicant from fulfilling the rest of the conditions. So, upon fulfilling the conditions for acceptance of an employment offer and resumption of duty with a company, it will be inconsistent with judicial precedent to hold that the employment contract between the worker and the company, in the circumstances, is inchoate, as Justice J. D. Peters did in the Ogbonna’scase, merely because the employment relationship commenced with probation. Employment contracts are not sui generis as they are governed by common law rules on general contract making which entail offer, acceptance and consideration, including part-performance. See Federal Government of Nigeria v. Zebra Energy (2002) 18 NWLR (Pt. 798) 162. In my view, a worker on probation is entitled to all the benefits stated in a contract of employment which are enjoyable on probation and those implied by law in deserving circumstances. A worker on probation is entitled to be paid the agreed salaries for the probationary period. He is also entitled to pension contribution from the employer. An employer of a worker on probation cannot deny liability for remitting personal income tax of the employee on the ground that the worker’s employment was probationary. If probation lasts longer than a year, in my view, the worker is entitled to an annual leave. Both the employer and employee are entitled to terminate the working relationship during probation as agreed in the employment contract. It is necessary to repeat here, only for emphasis, that in addition to the foregoing benefits, a worker on probation is entitled to all other benefits or rights provided in his contract of employment which are enjoyable during probation. Confirmation is an attestation of an employer that a worker’s performance is satisfactory in a period of probation for the purpose of extending the employment in accordance with agreement. The length of probation before confirmation is a matter of agreement. Most employment contracts provide for power of the employer to extend a period of probation if the worker’s performance is unsatisfactory. Whenever confirmation is due, it is advised to be in writing (in a letter or memo of confirmation) with all necessary incidental terms clearly spelt out to avoid the incidence of legal presumptions. Upon confirmation, a worker stands to enjoy all the benefits which are attached to his employment. Confirmation of employment may be express such that an employer writes a letter or memo to the employee or circulates same within the company to confirm a worker’s employment at the end of probation. However, where probationary period has ended but the employer neither expressly extends it nor terminates the employment, the law presumes that the employment has been confirmed impliedly. Under Nigerian employment law, at least from the various cases reviewed in the course of this work, there is no implied extension of probation by the employer and no such presumption is made in favour of an employer where such employer fails to expressly extends a probationary period or terminates an unsatisfactory service of a worker which extended after the expiration of an agreed probation. In line with international best practice and labour standard, a Nigerian court held in a case that the continuation of services after expiry of the probation period without a new contract being drawn up means that the employment has been impliedly confirmed and that a contract of indeterminate duration has taken effect from the date when the offer for probationary service began. In the said case, the claimant was engaged for a probationary period of two (2) years but he was made to work for six (6) years without confirmation. The employment was eventually terminated without notice or salary in lieu of notice. The argument advanced by the employer was that the employment was never confirmed. The court rejected the argument of the company and upheld the claims of the employee in part. According to Honourable Justice P. O. Lifu (JP), such termination amounted to unfair labour practice contrary to section254C (1) (f) of the Constitution as same was incompatible with international best labour practice. There is no specific legislation regulating confirmation of employment in Nigeria. However, whenever there is any employment dispute regarding probationary service, the employment contract is usually the proper guide to understanding the rights of a worker under probation and after confirmation. The employer must follow whatever procedure that is agreed in the employment contract. Where confirmation of employment is subject to satisfactory performance by the worker, a performance appraisal is essential, in my opinion, to evidence a transparent process by which an employer arrives at a decision not to confirm an employee’s service after probation. Promotion of staff is a most controversial aspect of employment relationship largely because of its perception or misconception as a right or privilege. Promotion or lack of it can turn out to be ugly, leaving an unsavoury feeling in a work environment, depending on the procedures adopted by a company to arrive at a decision to promote or not to promote. Generally, under Nigerian employment law, promotion is not a right but a privilege; it is usually expected to be earned. Though the foregoing principle of law has its exceptions. In a case decided by Honourable Justice Shogbola of the National Industrial Court on 9th April 2014, the court found for a claimant who has been unlawfully terminated from employment as a police officer but refused to grant the reliefs on promotion on the ground that promotion of staff is not a right. Interestingly, however, about a year after, Honourable Justice J. D. Peters of the same court, in another case, held on 5th March 2015 that where promotion is based on agreed conditions which the employee has fulfilled, it would be a breach of agreement if the employer fails to approve his promotion. What is clear from a review of cases on promotion is that where a company’s staff handbook or terms and conditions of employment provide for clear procedure for promotion, failure of an employer to comply with the procedures may give rise to liability for breach of contract in an action against the company by an aggrieved staff. There is no laid down rule or guide for determining a right or wrong promotion decision. Every employment contract will have its own peculiarities on which, upon a proper review, an employment lawyer can provide independent advice regarding the rights of either party. Perhaps I should add that it is an onerous task for an aggrieved employee to successfully challenge his employer’s decision on promotion, however unfavourable. There is a presumption that every employee understands the terms of his or her engagement at the time of accepting an offer of employment; and the onus to prove any allegation of fraud or inducement rests on him. Malice and discrimination are not enough in themselves to impute liability to a company unless there is a clear evidence to support such allegations. Where a decision on promotion has been wrongfully exercised, the court has power to entertain the complaints of an aggrieved employee who has been affected by such decision. In the discussion of promotion in employment law, the requirement of “satisfactory performance” is the most subjective condition a worker is required to meet. This is because the management of company determines what amounts to satisfactory performance of a worker. Hence, the court usually adopts a strict rule of interpretation of any promotion policy and will readily resolve any ambiguity in the policy in favour of a worker. In a case decided against Zenith Bank Plc, the employment contract stated that the claimant would be promoted upon confirmation and subject to an above average performance rating (minimum of B+). The claimant’s employment was confirmed at the end of probation but he was not promoted despite his “A” performance rating. The court, relying on the last performance appraisal, found for the claimant on the ground that his performance was satisfactory to merit promotion. Consequently, the court awarded damages in the sum of money representing the difference in salaries of the claimant as the time of the suit and those which he would have earned in (as well as bonuses and benefits accruable to) the higher office to which he ought to have been promoted. The management of a company reserves the right to review the terms and conditions of an employment contract, including those pertaining to promotion of staff. However, when such review takes place, every affected staff ought to be promptly informed about the details of the new promotion policy. It is advisable to ensure that such management decision is not perverse as such that will give the impression that an employee is obviously prejudiced or denied of an entitlement which has become due. Where promotion is due to a worker, any unilateral decision by a company to review a promotion policy to prejudice or deny the worker may be deemed as a breach of agreement. Such affected worker may be entitled to compensation in damages in any action challenging the company’s decision during or after his resignation from the employment. It only needs to be added that when a prejudicial decision is taken on promotion, a right of action is deemed have accrued to an affected staff and he or she is entitled to resign immediately and seek redress against the company.